Lauren Murrant is the second recipient of the DELWP Diversity and Inclusion Scholarship. Hailing from Berwick, Lauren began a Bachelor of Arts at Monash University, before transferring into the Bachelor of Design where she was awarded the scholarship. The DELWP Diversity and Inclusion Scholarship supports commencing Bachelor of Design students who intend to major in Urban Planning. The aim is to support the diversification of our student cohort and, consequently, of future urban planning professionals entering the workforce who will go on to shape our urban environment. The best way to facilitate a robust and inclusive urban planning agenda and future for Victoria is to ensure that the planners themselves are from diverse backgrounds. What attracted you to study urban planning? I was attracted to urban planning because it combines past, present and the future. I think it’s important for my generation to step up and have a say in the ways our cities are built. I love that this major gives me an opportunity to help shape our future and the ways we live. You are just over halfway into your first semester of the Bachelor of Design, how are your classes going? The classes have been pretty full on. I didn’t expect the initial workload so I struggled to keep up during the start. However, now that we’ve reached half way I feel like I’m getting into the swing of things and have figured out how to cope with it. I found that lecturers and tutors push you to do the best work possible. The expectations are very high and whilst that has made it super daunting, I find that it really encourages me to put out work of a high standard which I’m happy to show at pin up even if it isn’t the best in class. I also really love how I’m exploring multiple various aspects in the disciplines within the Bachelor of Design. First year allows us to pick from the wider selection as we only focus on our majors later. This means that I’ve been doing work on my computer in software such as the Adobe suite and Rhino whilst also getting to do hand drawing and model making in my classes. They’ve already given me so many opportunities to try out and create things I couldn’t even dream about. The subject Introduction to Urban Planning has been my favourite so far. It encourages you to think about your ideas in depth and how they can be applied in the real world. I also enjoy Global Foundations of Design, I’ve always loved history but this encourages me to look from an architectural point of view rather than solely factual. I never even thought about how each individual building would play a role in our development over time. Has the DELWP scholarship changed your view about university? I believe that the DELWP scholarship has made my university experience less daunting. I feel that I can now just focus on my work rather than having to stress financially, especially seeing as the little jobs over the semester truly does add up. My old laptop would have struggled to keep up with the software demands, having the scholarship allowed me to purchase a new laptop. With my current living situation an hour away from the university, this has allowed me to access the materials I need on the go. How has the DELWP scholarship changed the way you view your future career? The DELWP scholarship has allowed to truly explore what opportunities I could have in future. I feel that I am less limited and that I can actively make an impact within the wider Australian community. 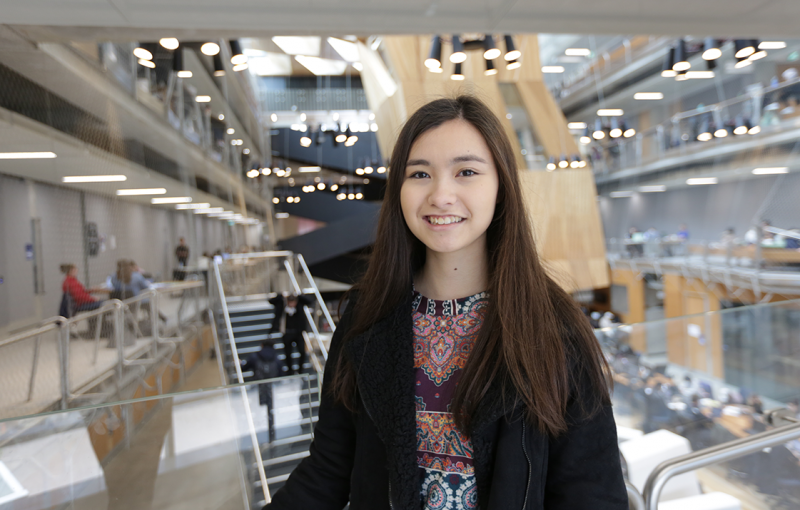 Before, I felt that I was restricted to only a limited amount of opportunities within my local community but having the support of the University and the DELWP has made me feel that I can achieve these goals within a much broader area. I feel that having a connection with the DELWP means that will be there to support and assist me as I move into Urban Planning professionally. One of the factors in selecting a DELWP Scholarship recipient was a short written piece where you identified what you think are the top planning challenges facing your community – what did you write and how do you see the DELWP scholarship assisting you in addressing these challenges in the future? I focused on development for the present and future of our communities. I felt that this was significant because my own community is constantly expanding due to a growing population. My community needs to have a strong focus on the future in order to cope with current demands. I discussed how there needs to be development of infrastructure to enable equal access to equal opportunities. A major issue is also the current mindset of those involved with planning and how their focus needs to shift towards positive development for all members of society. I also discussed the importance of acknowledging and observing Aboriginal and Indigenous Australian’s way of life whilst also integrating them into the community. Planning for our future is a major issue. Melbourne is growing very rapidly and our current systems will not be able to cope with demand and as a result, communities will struggle in future. I feel that through Urban Planning, a positive impact can be made to our community to solve these problems and enable future generations to thrive. The Melbourne School of Design is definitely my favourite place. It’s such an obvious answer but it’s so convenient for me in terms of accessing resources, classes and assistance. I love the environment within the building and the availability to study in groups or alone. I love heading down to Castro’s kiosk to get coffee. It’s a regular meeting spot with my friends and the coffee is great. It’s right opposite the MSD too making it super convenient when I’m studying there. Pronto’s pizza is another frequented place for me, the pizza is cheap yet delicious so perfect for us university students! Typically, if I need a library, I’d head down to the Baillieu Library. I usually head down to the basement and find a quiet spot to do work. I think a dream project for me would be something that benefits my local community. They’ve given me a lot of opportunities so I want to give back to them in some way. I hope to create a public space that all members can access and find interesting, to make sure all of them feel included within the community. Either that or improving our public transport infrastructure within my community to ensure everyone can get around with ease. The DELWP Diversity and Inclusion Scholarship is a collaboration between Department of Environment, Land, Water and Planning (DELWP), Medley Hall and the University of Melbourne.